Creating a great work environment has come a long way in recent years – brilliantly designed for maximum collaboration and comfort. They’re bright, airy and provide the flexibility you need to perform at your best. These open work spaces come with many distractions, too: conversations among co-workers, phones ringing, printers, even outdoor created noises. Our ability to perform at top level is directly tied to our ability to focus and, for most of us, distractions take our focus from our work and direct it elsewhere. In addition to productivity concerns there may also be confidentially issues. An open work space can lead to compliance concerns if the proper steps aren’t taken. Sound masking doesn’t take any sound away, it actually adds sound to the space. It doesn’t make the office quieter. Instead, it adds a low-level pleasant noise to a space to help reduce the distraction of other conversations or noises. Sound masking can’t eliminate a loud co-worker’s voice. A = Absorption – This is the effect that soft surfaces have in your work space. The sound wave is absorbed into the carpet, soft cubical wall or the acoustical ceiling tile so that most (if not all) of its energy is attenuated or reduced. This is your first line of defense against distracting work place noises. Steps taken here will result in an immediate improvement. 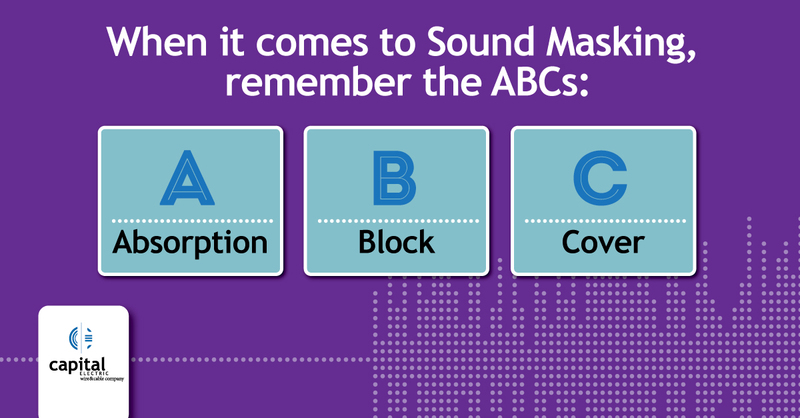 B = Block – Just as the word implies, we’re talking about blocking the sound wave with a wall or a panel to keep it from continuing on its path. Blocking helps keep private offices quieter than open offices by using the walls and doors to keep most of the sound contained. For most open concept offices, this is the area that provides the most difficulty because there’s very little preventing conversations from traveling throughout the space. If we can’t block it, we take the next step. C = Cover – To cover means to overlay a new sound that covers up the existing one to make it less distracting. It doesn’t remove the original sound, it simply lays over it which makes the conversations next door sound like background noise instead of something to tune into. A properly designed speech privacy system will sound just like an HVAC system blowing air around in the background of your work place. If planned, installed and tuned properly, the system is undetectable because it floods the space with this low-level background noise (pink noise generally). Even while walking from area to area the uniform sound is such that you can’t tell where the speakers are. That’s a sure sign of a great sound masking system. AtlasIED designs and manufactures multiple speech privacy or sound masking solutions for many different office spaces – from single rooms to multi-story, multi-zoned high-rise office buildings. Contact us to investigate a solution for your space.